It's Ramadan, the Muslim month of fasting. For 29 or 30 days, depending on the lunar cycle, Muslims refrain from dawn until sunset from eating and drinking. It is at the toughest time of the year this time, at the height of the summer when temperatures rise above 40C during the day and hardly drop below 30C at night. In addition, the days are the longest now, and the fasting people are required to fast for more than 13 hours, here in on the Arabian Peninsula. While I am not fasting, I very much enjoy the quietness of this month. By law, the fasting people have shortened working hours. At around 3pm everyone goes home. By law, restaurants and cafes are not allowed to serve food during the day (while delivery is still allowed). In fact, non-fasting people are not allowed to eat, drink or smoke in public during the day. There is no blaring music in the shopping malls. It's a very subdued atmosphere during the day that highlights how stressful, hectic, rushed and noisy our lives have become outside Ramadan. We don't eat out a lot for various reasons: the kids are not very experimental when it comes to new foods. I find myself in the kitchen cooking for them as soon as we get home from a restaurant or cafe visit. I had one too many slight cases of food poisoning. The food is often very expensive and the dishes don't live up to the expectations, either taste-wise or portion-wise, or both. All that adds up to have even more reasons to rely on homemade foods. 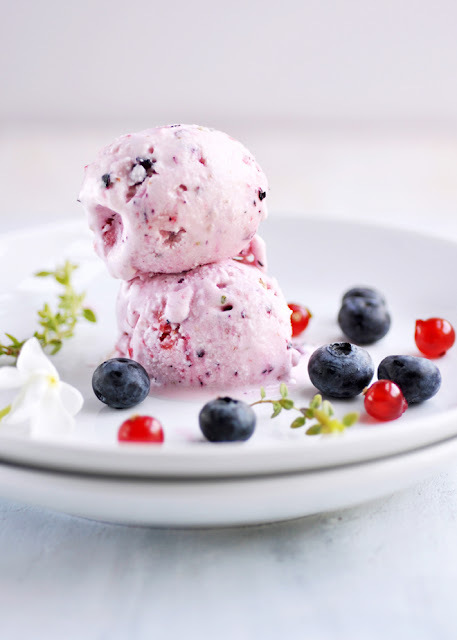 Now that the summer is here full blast, the cravings for cooling ice creams and sorbets have dominated over all other dessert requests. I still make all our ice creams with an ice cream maker. Looking at the ingredients lists of store-bought ice creams alone, justifies the investment to be able to make ice cream at home. The amount of ice creams eaten in this house will make the money spent worth it. So here is another three-ingredient recipe: yogurt, berries and honey. That is all you need. With a little extra work it will make perfectly fine and delicious ice cream, even without an ice cream maker! * If you use regular whole milk yogurt, strain about 2 1/2 cups of whole milk yogurt through a cheesecloth or clean kitchen towel for two hours. Discard the whey. Roughly chop the berries, so the juices can ooze. Mix strained or Greek yogurt with honey and chopped fruit. Pour the yogurt mixture into a shallow bowl or pan. Freeze until almost solid, about 1-2 hours. Take out of the freezer, and thoroughly stir it with a fork. Put back into freezer and freeze until solid. Scoop out the frozen mixture and place it into a food processor. Pulse until smooth. Transfer frozen yogurt to airtight container and return to freezer until ready to serve. Pulse again in food processor if necessary, before serving.